August 13, 2011, marked another milestone in Germany’s long journey to move beyond its troubled past. On that day, dignitaries and others gathered in Berlin to commemorate the 50th anniversary of the construction of the Berlin Wall. For decades, the wall was a potent symbol of the Cold War between the West and the Soviet Union. In the early morning hours of August 13, 1961, East German soldiers had hastily laid the foundations of a barrier intended to stop East Berliners from fleeing to prosperous and free West Berlin. Guards stationed at the wall were ordered to shoot anybody who attempted to cross. Over nearly three decades, perhaps as many as 700 died in their attempt to reach a better life. The Berlin Wall was torn down in 1989. Since then, the city has undergone an inspiring transformation. More than 5.5 million tourists visit Berlin annually, making it the third-most popular destination in Europe. “Cold War tourism” brings many to Berlin, where they can trace the Berlin Wall’s route in a vintage East German car and have their passports stamped by an actor posing as an East German border guard. Tourists exchange their euros for East German marks or even duel with Darth Vader in the shadow of the Brandenburg Gate. All for a fee or a generous tip, Danke very much. Some Germans decry the influx of entrepreneurship as the “Disneyfication” of the Berlin Wall. Others see it as the natural by-product of capitalism’s triumph over communism. 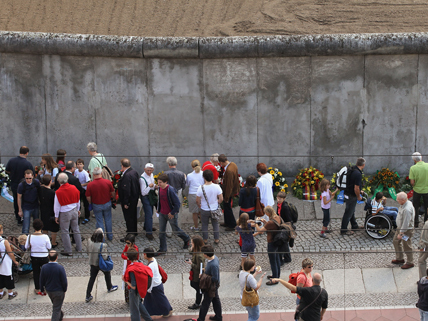 With the events surrounding the recent anniversary behind them, ordinary Berliners are left to ponder the question of how properly to commemorate a painful part of their past. Explore the Guardian newspaper’s reporting on the Berlin Wall’s construction at the time; includes links to primary sources. Learn about the “Disneyfication” of the Berlin Wall and reactions to it; check out the Before/After interactive feature. Read about official ceremonies commemorating the 50th anniversary of the construction of the Berlin Wall. View 30 historical and contemporary images of all phases of the wall—construction, demolition, and commemoration. Find out how Berliners feel about the wall a half century after its construction, and two decades since its fall. This was very interesting and informational. I never knew they had this kind of stuff in Germany. So true. Honesty and everything recgnoized. it was just last school year i started learning about this. my teacher told me to look up this site and learn some more if i was interested. this article was very factual. and i really enjoyed it. The year should be 2011 instead of 2001 in the first line of the story if it is 50 years after 1961. So true. Honesty and eveyrhting recognized. I think the Berlin wall was cruel to the people. When I first learned about this, I asked my dad about it and told me everything! In a way I’m glad it’s torn down but, it’s a historical landmark. What would’ve happened if the wall didn’t get knocked down?